As a promise to myself, I decided to buy the brush set of Ellana for the samples that I requested. Aside from that I even purchased a sample size concealer and mineral powder primer (base makeup). Then I purchased an eye shadow, glossy hair shine and the brush cleaner spray. 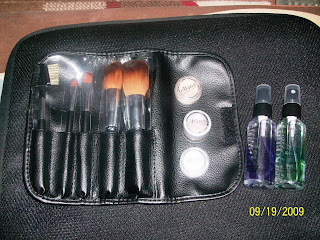 5-pcs makeup brush set composed of a full powder brush, angled blush brush, concealer brush, eye shadow brush and eyelash com brush. Costs Php 800. I've used them last Sunday and the bristles are so soft that it will not irritate your skin. Mineral Powder Primer is a finishing powder and powder primer in one. Sample size 1gram is Php 100. It only has one color which is white chocolate. Mineral Concealer sampler size costs Php 100. The trick in selecting the color of your concealer is that it must be two shades lighter of your skin tone. Multipurpose Mineral Powder Eye shadow can be used as eye shadows, eye liners, blushes, lip colors, bronzers and body shimmers. 5 grams jar cost Php 130. They have 55 different colors to choose from. One bottle of the Frizz-Free Hair Gloss Spray costs Php 120. It really works! My hair is shiny and soft. One bottle of Brush Cleaner also costs Php 150. Made of tea tree that keeps the brush bristles clean and soft. Obviously I'm still an amateur when it comes to make-up department...hehehe. Looks like I will be coming back for more Ellana MMU! awww, expert or not, your makeup looks very nice on you, not overly done. congrats, am a big fan of Ellana mineral makeup, too. Hi sisses! Yeah I know that I will be coming back for more shades and colors of MMU! Ahahahaha!